Do you need a load of concrete delivered in the Bronx, Manhattan, Queens, Brooklyn or Staten Island? 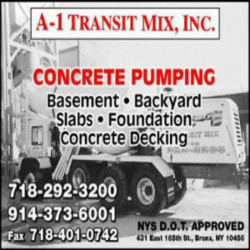 A-1 Transit Ready Mix covers all New York City’s 5 Boroughs and the Yonkers area. If you need more information how to order your ready mix concrete load, other products and services, please, feel free to call Frank oat (718) 292 3200 or at (718) 292-3255 or drop us a line by filling out the form below.